GALLERY: To view images of The Granary – click here. The Granary is an approved venue for civil ceremonies and our first floor function room, The Barratt Room, can accommodate up to 80 guests for a ceremony, 70 guests for a formal seated meal or 100 guests (mixed occupancy). We are situated in beautiful surroundings next to the River Stour and are able to offer our boats as part of any chosen wedding package (Spring to October). Our packages include a fully staffed, stocked and licensed pay bar (excluding The Granary Civil Wedding Ceremony) and drinks can only be provided through our approved contractor (details below). The River Stour Trust holds a premises licence for the Granary and in accordance with the Licensing Act 2003 all beers, wines, spirits, ciders and soft drinks dispensed must be supplied by or through the River Stour Trust or our designated contractor who oversee management of the bar and provision of drinks. More information about the bar is provided below. Alongside the hire charge, a refundable breakage deposit of £250.00 is also payable one calendar month prior to the booking. An additional charge applies for the Registrar to perform the ceremony. Should you wish to hold your ceremony with us then please make sure that you also contact the Registry Office to discuss their charges, requirements and availability on the date you have chosen. 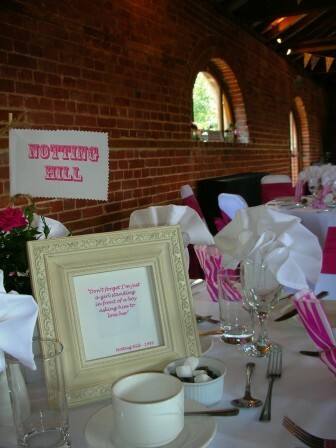 The Granary Civil Wedding Package requires the premises to be vacated 2 hours after the ceremony. The Granary Civil Wedding Package does not include bar service/provision of drinks for which an additional charge applies. The River Stour Trust holds a premises license for the Granary and in accordance with the Licensing Act 2003 all beers, wines, spirits, ciders and soft drinks dispensed there must be supplied by or through the River Stour Trust or our approved contractor. No alcohol or non-alcoholic drinks can be brought onto the premises that has not been purchased through the River Stour Trust or our designated contractor. If any drinks are found on the premises, including in cars in the car park, your entire deposit will be forfeited. Please make your guests aware of this policy. You are welcome to choose your own suppliers for catering, decorating, entertainment, etc and we can recommend suppliers familiar with our venue. We are able to offer our boats as part of any chosen wedding package (Spring to October). Please contact us for more details about our boats. Click here to go back to main page for useful downloads/links and the online booking facility. Please do not hesitate to contact us to discuss your requirements further.